NINH THUẬN — Residents of Ninh Phước District’s Phước Sơn Commune in the southern province of Ninh Thuận are worried because of the increasing number of landslides along the Dinh River. The landslides are a threat to people’s lives and have affected agricultural activities and incomes in the area. Last year, in early October, several metres of land along the riverbank collapsed, though it was not raining. A month later, owing to prolonged heavy showers, the river’s water levels rose and washed away nearly 10,000cu.m of cultivated agricultural land. Since then, land along the riverbank has been collapsing constantly. The area where there are landslides is around 1.5km long and is 3m to 10m higher than the river water level. The river is now encroaching 20m to 30m into the land. Lê Văn Thủy, a resident of Phước Thiện 3 Village in the commune, said his family owns 5,000sq.m of land, which is regularly cultivated. But last year, in the beginning of November, there were floods that caused landslides across more than half of his property, and swept away 120 apple trees, 20 custard apple trees and 25 coconut trees, which were ready for harvest. The floods also washed away his agricultural equipment and tools, resulting in a loss of hundreds of millions of đồng (VNĐ100 million = US$4,400). 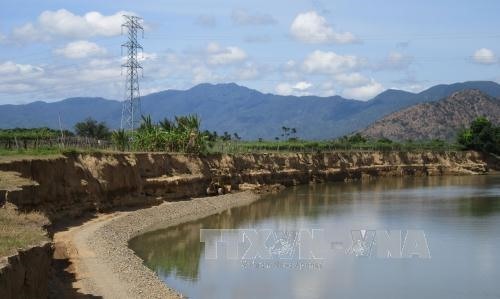 Locals blame the landslides on Việt Trung Co Ltd, which does sand exploitation in the river, alleging that the firm has obstructed the water flow as a result of which the flow has changed direction. However, after inspection, Ninh Thuận Province authorities said the reason for the landslides is a warp in the middle of the river, which has altered its flow. During the floods, the flow was even stronger, which led to landslides. Though the provincial Department of Natural Resources and Environment has not said anything about the responsibility of Việt Trung Co Ltd’s sand exploitation operations, it has ordered the company to clear gravel from upstream waters and spread pebbles along the riverbank to prevent landslides.